Driveway Before...In need of Restoration! 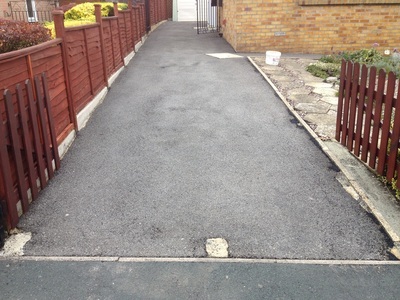 ﻿This tarmac driveway was looking tired and faded, and in need of restoration. Wear & tear lead to brittle tarmac over time, inevitably causing the surface to break up and then needed costly resurfacing. We were able to restore it to looking like new. 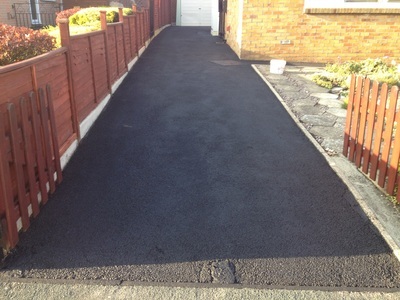 Restoration makes your driveway look as good as new by restoring its colour at a fraction of the cost of replacement. (available in standard black, red and green). It protects it against normal wear and tear, thereby doubling or even trebling the life of your driveway. It severely inhibits weed, algae and moss growth on, and enables easy-clean of oil leaks and fuel spillages. It also helps prevent cracks appearing. Over time, tarmac degrades due to exposure to sun, rain, freeze/thaw cycles, de-icing salts, fuel, oil, wear and tear etc which dry it out and damage it. The binder or “glue” holding the aggregate together will break down resulting in cracks in the top layer which, If left untreated, will allow water penetration causing more cracks, ruts and potholes and the eventual breakdown of the tarmac. Tarmac sealers bond to the existing binder to shield it from further degradation, they are not a 'topping' and do not replace lost binder.